1. Traditional B2C startup: You make your product, and distribute directly to Users, some or all of which are paying. This direct-to-market model is quite new due to the internet as the ultimate software distribution mechanism. 2. Traditional B2B: The people who will use your software are not necessarily the ones doing the purchasing. Adoption of software in the enterprise is traditionally top down, decreed by a complex interaction between various internal stakeholders like IT departments, management, purchasing, etc. It is up to the developer to suss out the right person(s) to talk to in order to even get their software in the hands of Users. Furthermore, this inhibits Lean methodologies for incremental innovation based on an MVP. 3. 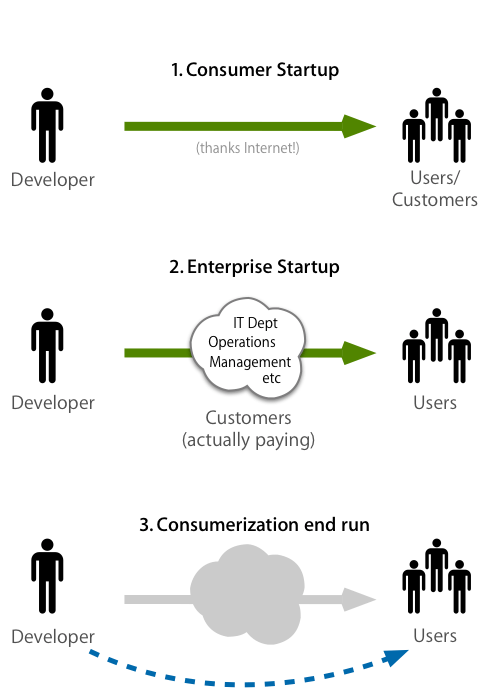 Consumerization of Enterprise: This is a recent trend in enterprise, a bottom up model where workers on the front lines discover and use their own solutions. Users then convince the hierarchy above them to adopt a technology either by asking their managers and IT depts for it, or by those upper levels noticing the improvement of efficiency. This is another kind of adoption first strategy. Off the shelf technology is becoming more prevalent in the enterprise, and forward-thinking organizations are taking advantage of this. Depending on what kind of company your B2B startup is trying to sell to, doing an end run around traditional organizational barriers to gain internal adoption might be a good (if long term) strategy. The next question is: how do we achieve this end run? If you like thinking about this kind of stuff and are in the Okanagan area, I highly recommend checking out the #LeanCoffee group in Kelowna.